So you wake up at 3:16am on your birthday? Is it the excitement? Or is the great honking birdlife outside across the creek? I'm tipping the birds. Anyhoo, it gave me half an hour or so to think back on past birthdays. Here's a few trips down memory lane. Be warned, not all of them show me in a particularly lovely mood. 1. Age 6: The McDonalds Birthday Party. Now it's a little while since I was six so I can't actually remember if this was my birthday or one of my little grade one friends. I don't think that actually matters. What I do remember is the cheeseburger, the icecream cake, the poor girl working there who had to entertain us by playing games with McDonald's paraphernalia, and the playground outside to which we all retreated after the inside fun was over. 3. Age about 10 or 11: The Birthday party at home with all your school friends. LOTS of presents. Mainly books - surprise! But two other gifts remain stuck in my memory. Some groovy shoelaces - white with pink kisses on them - meant to be worn as hair accessories. I thought they were so cool. It was the 80s so stop scoffing. And a china shepherdess ornament that WAS ALSO A BELL. We played pass the parcel, statues, drank a lot of cordial and another great game that involved everyone taking off their shoes, mixing them up in a big jumble at the end of the backyard and then having to run and find your own. Yes, I know it sounds lame now, but it was fun at the time. 4. All the birthdays from age 10- 12 when I didn't get a Cabbage Patch Kid. They were new, they were hyped, everyone else seemed to be getting one except me no matter how much I whinged about it. And then, the ultimate betrayal, my younger sister arrives and by the age of THREE has a Cabbage Patch Kid. I still bring this up sometimes in family conversations. The same was true for Poppers ( My brother and I didn't get them, while my sister did) and watching Australian soap operas. I may have been the only person in my peer group who wasn't allowed to watch A Country Practice of Neighbours. Not that it's scarred me for life or anything. 5. Age 13: The Teenage Tantrum Birthday at the Gold Coast. 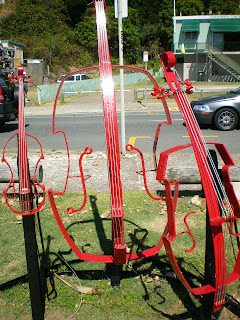 I had just been away on a two week tour with the local youth orchestra travelling to Sydney, Canberra and through NSW. I may have been a little overtired. 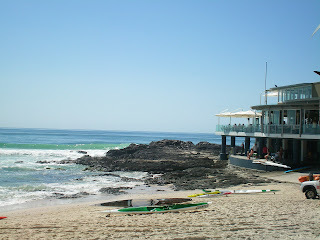 I met back up with my parents at the Gold Coast and we spent my birthday in my grandparents beachhouse at Palm Beach. Memories are a little hazy but there seemed to be difficulty in finding a cake. My father (ever the one for the "cheaper" option - and I say that in a loving, daughterly way) came home with a jam sponge. A JAM SPONGE I ASK YOU?. It didn't even have proper icing!!! Cue, Wendy throws a tantrum most unbecoming. 6. Age 16: The New Watch, Getting your learner's permit birthday. Suffice to say I don't think that Mum's Datsun 200B ever quite recovered from the numerous times I stalled it. I didn't understand gears then, and don't really now. That's why I drive an automatic car. 7. Age 17: The Second Tantrum Birthday. I had a perforated eardrum and had spent the previous evening waiting in the outpatients at the dreaded BUNDABERG HOSPITAL. Needless to say I wasn't really in the mood to go to school and find my friends had photocopied and distributed posters that it was birthday round the school. I WAS NOT IN THE MOOD. 8. Age 18: The University Birthday. I was at Uni...first birthday away from home. Great friends made it a great day. Pity I don't see any of them anymore. It was exciting going to the post office and finding my present from home there ON THE ACTUAL DAY though. Oh...there may have been alcohol involved. Let's not go there. It's all a little unflattering. 9. Age 21: Funnily enough this was particularly unmemorable. I don't even know what I got. Well, here The Spiralling Shape continues its occasional series in which Wendy catches up with seminal dancing, singing, music movies from the 1980s that she has never managed to watch before. Today's topic is Fame (1980). What's weird about this is that as a young person we watched the TV series Fame well before I encountered the movie. Then one day, not long after my family bought a VHS recorder, we rented the movie Fame thinking it would be similar in tone etc to the television episodes. Big mistake. After half an hour of "bad language" (i.e. swearing) the video was turned off and I never got to see it again until yesterday. I might have been 11 or so at the time I think. So what a treat to sit down last night and watch Alan Parker's film. (One of my other absolute favourites is The Commitments). Fame was nicely gritty and is certainly is no High School Musical. That's a good thing by the way. I was particularly oblivious to the other songs that were in the film (apart from the title track which is perhaps the most annoying). I enjoyed them a lot even if they seem a bit sappy now (nearly thirty years later). I loved the scenes where Doris and Ralph went to see The Rocky Horror Picture Show, and the depiction of the difficulties of actually ever making a living in the performing arts. Speaking as one who studied a degree in music long ago, it seems very few people "make it" (whatever that really means) and many, years later, find themselves doing very different jobs to those they dreamed of at age 17. I don't think I'll bother with the just released remake. But here, for your enjoyment is the final song. Verdict: It has aged more gracefully than Footloose. Next stop...maybe Flashdance. My hopes aren't high for that one. Let's waltz our way through Sunday shall we? I know you all eagerly await news of my Saturday shopping purchases so here we go. One pair of denim below the knee pants. I didn't try them on in the shop so they may yet be returned. One Indulge breafast - poached eggs, roasted cherry tomato, toast and coffee. One Indulge Gunpowder Green Tea. All in all, it was a satisfying morning in the main street, only slightly marred by the fact that on meeting my mother and sister for breakfast, my sister and I were wearing the same T-shirt. Accidentally, you understand. We took a photo. I shall not inflict it upon you here. It's really more of a Facebook kind of thing. Phew. I have a whole new respect for Paris Hilton. (That's a lie actually I have very little respect for Paris Hilton. In fact it could be characterised as none at all). However, two surprise TV interviews in the space of half an hour was somewhat gruelling. For those of you who haven't been interviewed by your regional news stations here's some tips. 1. Don't have more than an hour's notice that they are coming to talk to you. It was pure luck that I had done my hair and worn nice clothes to work yesterday. Lucky for me there was lipgloss in my bag. 4. Try to talk as quickly and babbly as you possibly can. I think I managed this one particularly well. 5. Don't watch the broadcast. Let your friends do it for you so they can be nice and supportive and say things like "your hair looked good". Thanks people. Ultimately, try not to get caught on campus when your supervisor, who would normally take on the job, is on leave. It's your friendly neighbourhood kookaburras here. Just a quick note to say how much we are enjoying providing your early morning wake up call service this year. We realise that in previous years we have been a little slack as it seems that you were able to sleep through the night in summer and not wake til at least five. We are seeking to remedy that ridiculous situation. Rest assured that this morning will not be the last where we begin our menacing cackling at 3:45am. We figure that if we're awake then everybody else should be as well. It's not just you we're waking up. It's all the other birdlife in the immediate vicinity. So not only do you get to hear our laughter piercing the night air, but the other birds can join in the pre-dawn chorus, sustaining it while we are taking our big breaths in readiness for our next big shout out. Anyway, don't fret, we shan't be stopping this anytime soon, so you can look forward to a long hot summer of waking up really early. The Kookaburras out the back. Glee was a repeat of episode one. Darn. Now I have to wait until next Thursday at 7:30. And then I forgot about the Skippy documentary. Darn again. All in all not the most exciting What Wendy Watched post I grant you. Harrison (named after George Harrison, not Harrison Ford just so as we get that clear) spends his mornings lording it over me while I eat my breakfast at the computer desk. This is his morning ritual. Sometimes he falls asleep in a cute, furry fashion along the bench. Sometimes he sits in the fruit bowl (only when there is no fruit in it, which is quite frequently now that a cat has sat in it). I eat my cereal, checking my emails, facebook, twitter and of course lolcats I can haz cheezeburger. It seems we are creatures of routine most of the time. I say most of the time because I don't also run around like a nitwit and try and climb the back screen door while the glass sliding door is still shut, thus knocking my head into it with an almight thump. There goes another blog rule. 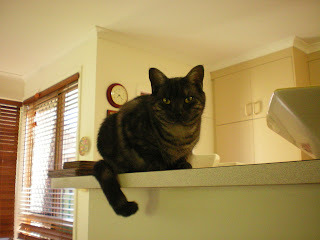 Picture of cat now posted. Oh dear has it really been a whole week since I last posted to the Spiralling Shape. I do hope that the gods of blogging can forgive me. Last week at work was revolting. It's that time of the term. Two and half weeks to go, everyone's getting stressed and angsting - or that how it seemed anyway. By the time Thursday afternoon arrived I couldn't wait to make my escape. This escape involved a trip to Brisbane and the Gold Coast from Friday through Sunday. My good parents were attending a wedding at Robina on Saturday, so my sister and I jumped in the car with them Friday morning and headed off down the highway to Brisbane. The parents met with their financial planner in Edward Street Friday afternoon while the sister and I sat quietly in the reception area, listening to the F111s practice for Riverfire and watching the financial types totter through in their high heeled shoes (that's the women you understand) and the men walk back and forth pleased with their own importance and money making ability. Well that's how it appeared anyway. We then spent a happy hour in Borders where I spent a lot of money in a short amount of time. What did I find? None of this stopped me the following day from going shopping to the monstrous Robina shopping centre and spending a great deal more money. Here I found what I was really looking for at JB Hi Fi - Leonard Cohen Live in London and bargan 9.99 Simon and Garfunkel Live in Central Park. There were also clothes and cheap jewellery purchases as well as two cute green tealight holders from Wheel and Barrow. All very necessary and needed you understand. The best part of Saturday was our trip to the Sculpure Festival at Currumbin foreshore. It was a perfect day and the fifty sculptures set in the sand just added to it. I took a photo of just about all fifty I think, but here (predictably) is my favourite. It was also great spending time with my cousin's music collection. He has an electric guitar, an acoustic guitar, a mandolin, a ukelele (stringless unfortunately), a lap steel guitar, a banjo, an autoharp, a drum kit, bongoes....and wonder of wonders they also had a piano accordion (which is for sale). Yes, I have put in an offer. I was very disappointed I didn't sound like Peter Buck when I picked up the mandolin. The lap steel guitar was fun also. Best of all was the drum kit. I'm sure I annoyed everyone in the house by practising my new found skills of a 4/4 rock beat at every available opportunity. I have a new found respect for drummers. It's really difficult. Either that or I am really uncoordinated. 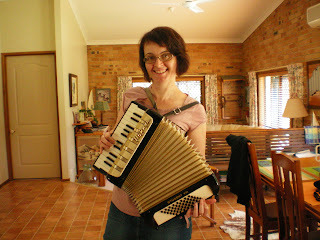 Anyway, because you've all been so good, here's me playing (although I use that term somewhat reservedly) the piano accordion. Yet again I break my self imposed rules of The Spiralling Shape by posting a picture of myself. But hey, at least it's not a picture of the cat. The 200th episode of Spicks and Specks was much the same as the previous 199. Dagginess and joy all rolled into one. Just like the Bee Gees themselves. Do you know which philosopher said that? This is one my favourite ever moments from The Office. So imagine my delight when I turned over my desk calendar this morning to find the quote of the day from that same great philosopher. "We cannot direct the wind, but we can adjust the sails". Some food for thought for a Wednesday. The Big Bang Theory was a delight again last night. The highlight was the boys' train ride to San Francisco in the same carriage as Summer Glau (playing herself). Now I have to admit I haven't watched either Firefly or The Sarah Connor Chronicles but that didn't matter. I laughed out loud. (something which doesn't actually happen very often when I'm watching TV). Enjoy. If you have to watch a traditional sitcom this might be the one. 2. Brush those stupid long sweepy fringes out of your eyes. You know who I'm talking too girls and boys. 4. The only way to watch it is to record and then timeshift to 8:30. You get it over in less than a marathon two hours because you can skip all the boring recaps, getting to know the contestants segments. 5. Toby - that Creep was a TERRIBLY song choice. If you can't sing the swearing it's no good. Besides you convinced noone that you were any kind of creep. 6. Not sure why Casey with the guitar got through. 7. If you find yourself reaching for the fastforward during the song you know it's a dud. 9. Marcia looked very nice. Pity we have trouble understanding what the on earth she is going on about. "Be yourself darlin' ". That doesn't actually mean anything. 10. That little country music boy James was the best of the lot. 11. Why does it celebrate all that melisma-ing all over the note? Just sing the notes in the centre and stop all the bending, sliding, and all together annoying slipping all over the place. 12. Sometimes it's good to sing quietly. Just a tip from me to all of you. Let's all give that a try next week shall we? Although with Rock as the theme I don't have high hopes. We all know how you've been misbehaving for the last two weeks. So before we get too far into the day I would like you to pause and think about your behaviour. Quite, frankly it's not good enough. Some of us have stuff we need to get done and it's difficult enough without your tiresome meddling. Sure, I see your point that it can be funny to mess with people's minds but I for one can do without it on the first day of the week. Go and sit quietly for a few moments and just think about the consequences of your bad behaviour. When you are ready to play nicely you may return and we can talk about how we move forward from here. Here's my verdict after forty five minutes of watching The Wire. I like NYPD Blue. Especially the Jimmy Smits years. Perhaps I could have perservered a little longer but quite frankly I just wasn't that interested. It seems President Obama and I have different tastes in television. I hope he's okay with that. I spent the afternoon watching my 6.99 bargain copy of Footloose. As I started I realised that I hadn't actually seen it before even though if you had asked me I would have said I had (if that makes sense). That song sure is catchy though. And what a fabulously stupid and ridiculous movie it is. Kevin Bacon dances up a storm in an uptight small town community. There's fightin', swearin' and preachin' as well as a game of chicken on big tractors. This last scene is perhaps the silliest in the whole film. Meanwhile Kevin's hair is very spiky and his nose all button like. John Lithgow, Dianne Wiest must wonder what they were doing, while Sarah Jessica Parker is extremely un-Carrie Bradshaw-like as the friend of the lead character, who herself is improbably named Ariel. Is she the Little Mermaid? No, she's just a rebellious teen with 80s curly,flicky hair who falls for Kevin, his dancin' ways, his love of Slaughterhouse 5 and knowledge of Men at Work and David Bowie. All in all very strange. This is all you really need to see I think. Maybe next I need to watch Flashdance, then Fame, then Billy Elliot, then Strictly Ballroom and any other movie about dancing that you can think of. Actually, perhaps I should start at the beginning with Fred and Ginger in Top Hat or some such. Clearly three isn't enough. I now have one more. If my wardrobe isn't going to overflow, there is going to have be some serious culling very soon. I. Must. Stop. Impulse. Buying......One Day. Just cause it's Thursday. There need be no other reason. What Wendy Watched: Oh yeah. Cool. That was me. Ah Wednesday. Spicks and Specks evening. There's nothing like a little TV routine is there? Let's see what fun the SandS gang are having tonight shall we. First we must sit through some boring promos for QandA. Oh and some ABC shop products. I don't think I need the sporting anthems cd really. It does have the theme from Rocky though. No, wait, that's reason NOT to buy it. And no, I didn't miss The Librarians. Well I did. But on purpose. Not a fan I have to say. Will I have to wait through a news update? Yes apparently. Vet, Hendra virus. Very sad. Economic growth. All fighting to take credit. How very interesting. Earthquake. Sounds scary. Always good to mention a tsunami. I just need to know who does Jenny Woodward's hair. Because it's not doing well at the moment. Perhaps time for a change? Oh but wait, there's more. Something about Custer. I don't want to reexamine history thanks all the same. They make it sound interesting but I doubt if it is. Midsomer Murders. Dull, but pretty to look at the gardens. Now surely, the show begins. Oh...but we must have a promo for something about the Exxon Valdez disaster. And ANOTHER promo for The Librarians. Desperation for ratings. Oooo just remembered I recorded The Wire. Apparently it rated well. Might save it for the weekend. Hello Adam! Guests: Someone we've never heard of from an "indie duo". Dave Hughes - did anyone say overexposure? Paul Gray from Wa Wa Nee!! A comedian...didn't catch the name. Whatever. Amanda Keller lookalike really. Way too much opening discussion here. Let's get to the games. Topics...good. 2000 OZ and 80s OZ. The Vines...where are they now? More chit chat. Get on with it. Now to the 80s. The Models - James Freud. Nice. Gee Chantoozies. Haven't heard them mentioned for some time. Where does the name Wa Wa Nee come from. Not really very interesting either. This is turning into a really boring episode. Except of course for the 80s mullet action from Paul Gray. At least he has a sense of humour about himself. Ooops. Now we're reenacting Myf's teenage years. Ah the auction question round. Those Kiss cups are pretty cool. But surely the Kiss guitar would be more than the cups. Hmm they got the order totally wrong. Surprise. And now Elvis items. Oh that jumpsuit is classy. Oh and they're all wrong also. Nooooo. Backwards played songs. This is fun. Lily Allen, Cher, more faffing about. Bobby McFerrin. These seem suspiciously easy. Jimi Hendrix, John Farnham. Oh You're the Voice. I saw John Farnham in 1990 at the Bundaberg Showgrounds. Support act Daryl Braithwaite. Oh yeah. Cool. That was me. They're really fond of this mini keyboard playing game lately. Mr Wa Wa Nee is playing for Myf's team. It's quite boring really. And now for Dave. Cue much hilarity. Because he's really bad. Get it. Oh dear I'm becoming slightly sarcastic of the innocent charms of Spicks and Specks. That was painful. How did they not pick Don't Get Me Wrong? One more to suffer through. Done good. And now for the final round. Quickfire responses. Woooo. A TISM question. Good-o. Hmmm. I just don't know if that was the most entertaining episode. But still, better than watching paint dry.Maybe. Bizarre final musical act. A 10 year old singing Sweet Child O Mine. Junior Australian Idol anyone? Oh she's going for the big bridge as well. Where are her parents? Huge voice though. Quick turning off The Librarians. This isn't exactly a Watch, Listen and Singalong. You see what happened was, after almost a year of listening to the same CD in the car, I thought to myself, "My CD player has been behaving itself. Perhaps I'll chance putting in a different CD. It won't stick like it used to when I was changing CDs regularly." So I diligently burned a new playlist and what do you know? Exactly! So, I had to resort to Classic FM this morning because the stupid player refused to even recognise the disc. It's temperamental. Anyway, long story short, it wasn't so bad because this was playing. Skip to 3 minutes and 9 seconds if you can't wait for the beautiful, rich melody (which in my opinion is a highlight) But, do take the 8 minutes to enjoy the whole thing if you can. Because it's wonderful.